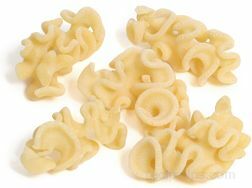 Noodles are fried to produce a crisp textured noodle. 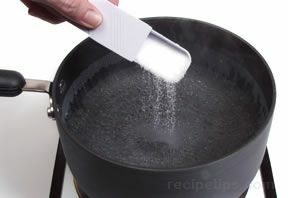 Frying can be accomplished by the use of two different methods, pan-frying and deep-frying. Both methods work on the principle of using hot oil to fry the noodles. 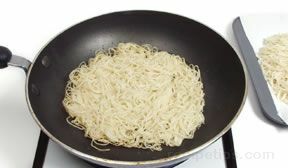 Pan-Frying: When pan-frying noodles, use a heavy skillet with deep sides. 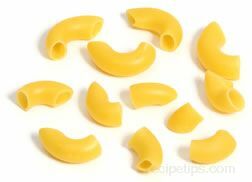 Noodles must be boiled or presoaked before they are fried. Rinse and drain boiled or presoaked noodles. Before frying, the noodles should be allowed to dry thoroughly. 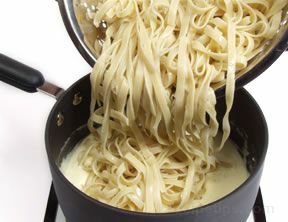 Have noodles boiled or presoaked and thoroughly dried before pan-frying. 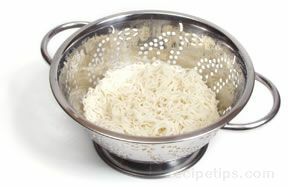 Rinse and drain boiled or presoaked noodles before frying. 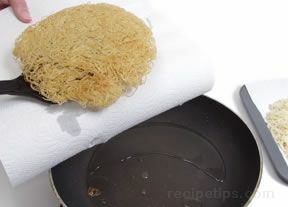 Place the noodles on a paper towel so they can dry thoroughly. Heat 1 tablespoon of oil in the bottom of a heavy skillet using medium heat. Divide the noodles into portion size bunches. Add one bunch to the heated skillet. Cook for 2 ½ to 3 minutes until first side is light golden brown. 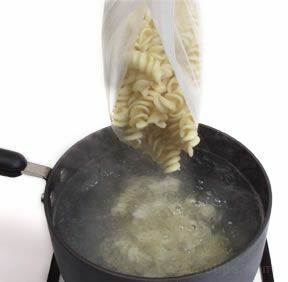 Once the noodles are properly browned on the first side, flip to the other side and cook a few more minutes until the second side is also browned. The fried noodles form a small cake. 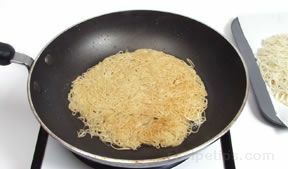 Remove the noodle cake from the skillet and place it on a plate lined with a paper towel to allow the oil to drain off from the fried noodles. Repeat the frying process with the remaining bunches of noodles. 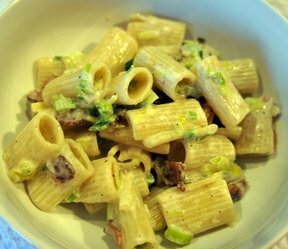 Keep the noodles warm while preparing the ingredients that will be served with them. 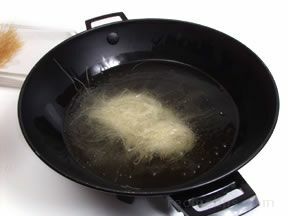 Deep Frying: There are several Asian noodles such as rice vermicelli and bean thread vermicelli (cellophane noodles) that can be deep-fried to produce a crispy noodle to add to salads and other dishes. 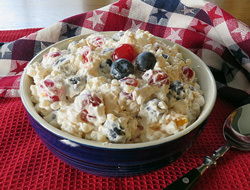 They are also used as a base for other foods to be placed on. 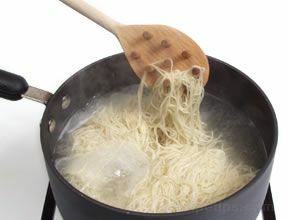 When placed in the hot oil the noodles puff up to almost four times their original size and become crispy. 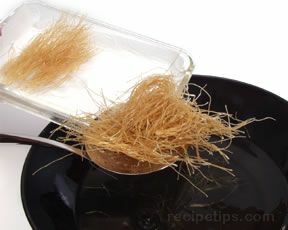 Nests of wheat noodles are also deep-fried and used as a bed for sauces and other ingredients to be served on top. 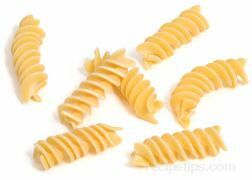 Cut the noodles into shorter lengths before frying. 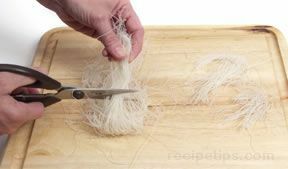 Using a kitchen shears, cut into lengths of approximately 3 to 4 inches. Heat oil, approximately 3 inches in depth, in a wok or deep-fat fryer to 375° or until it is smoking. Vegetable oil or peanut oil can be used. 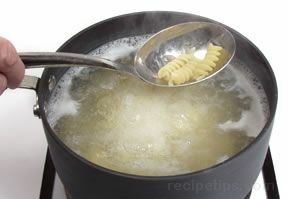 When oil is properly heated, place the noodles in the hot oil (the noodles should not be presoaked). 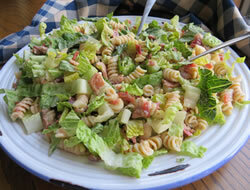 Within a couple of seconds the noodles will puff up and be slightly browned. 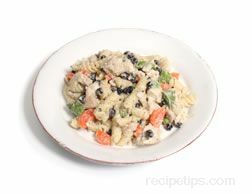 Use a slotted spoon to turn the noodles over in the hot oil and cook for a few seconds more, until second side is slightly browned. 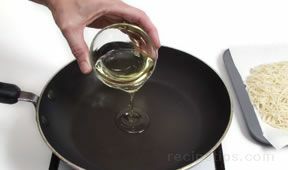 Using the slotted spoon, lift the noodles out of the oil and place them in a dish or on a plate lined with paper towels to allow oil to drain. 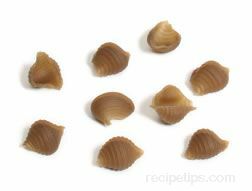 Keep in mind that the noodles will puff up to almost four times their size in width when adding them to the hot oil. Cook the noodles in small batches to allow for expansion while frying. 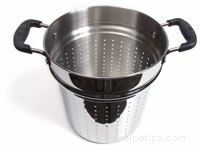 When you are finished deep-frying, the remaining oil can be cooled slightly, strained, placed in a container and stored for later use.